Mailed 9/20/18 to Subscribers. Allow 6-8 weeks for USPS delivery. 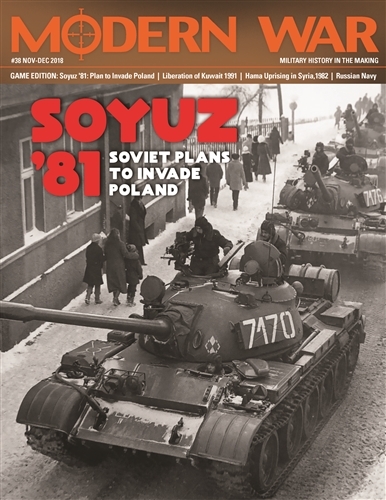 Soyuz ’81 is an intermediate low complexity two-player wargame covering the possibilities inherent within the first month of that never-run operation. The Soviet side encompasses all Soviet, East German and Czechoslovakian forces. The Polish side consists of that nation’s regular army and state militia. Each hex represents 16 miles (26 km) from side to opposite side. Each turn represents one tenth of a month (approximately three days). Each unit of maneuver is a division. The game map covers Poland and the adjacent jump off areas for the Soviet Army. 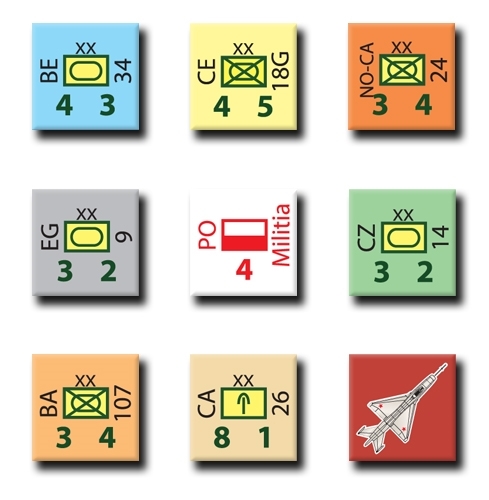 The Soviet player is cast in the role of aggressor, attempting to make work a classic strategy of “converging columns” advancing from around the periphery of Poland. His success or failure will be reckoned on his ability to bring that country to heel without having to expend an inordinate amount of military and political power to do it.